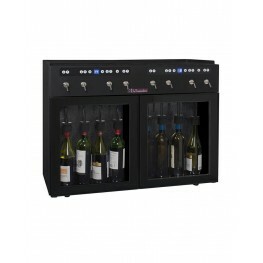 The DVV8 by-the-glass wine dispenser lets you simultaneously set eight bottles to their ideal serving temperature, protect wine from air oxidation and serve your wines by the glass in perfect conditions. 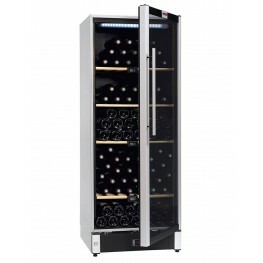 This means wine keeps for longer, up to three weeks after opening. With the double-zone feature, you can set both compartments independently of one another. 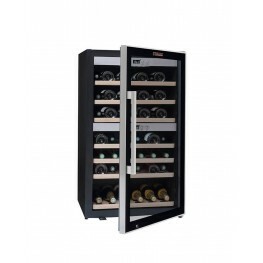 New for 2019, the PF160 commercial wine cellar has been specially designed with professionals in mind. 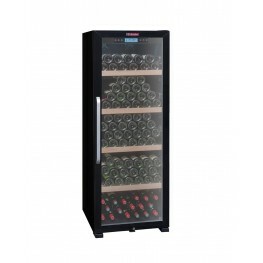 It has capacity to condition 152 bottles of wine and is incredibly convenient: reinforced door bottom and handle, bottle labels facing you for easier identification, security, reliability, style and much more. 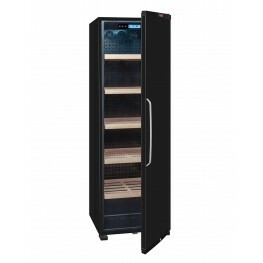 The VIP195N wine cellar is a multi-zone ageing and conditioning cellar. 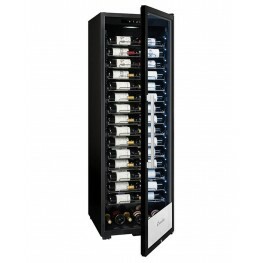 Manufactured in Europe, the VIP195N is suitable for free standing installation and accommodates up to 195 bottles*. Its blue interior LED lighting is absolutely stunning. 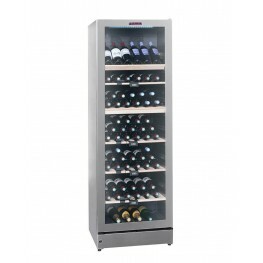 The VIP315V wine cellar is an ageing and conditioning cellar from the PRESTIGE range. 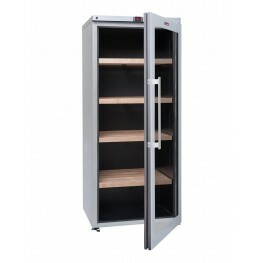 Manufactured in Europe, the VIP315V is eco-friendly with its A energy class rating. 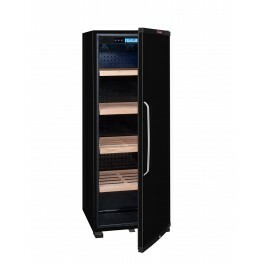 It is designed for free standing installation in your home and accommodates up to 325 bottles* for storage in optimal conditions over 3 temperature zones. 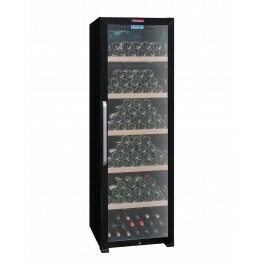 The VIP195G multi-zone ageing and conditioning wine cellar is manufactured in Europe and is designed for free standing installation. 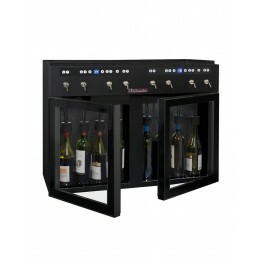 It accommodates up to 195 bottles*. Its blue interior LED lighting is absolutely stunning. Supplied with 4 solid-wood shelves. 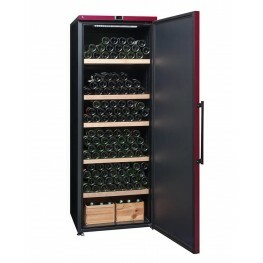 An attractive black ageing cellar with a solid door, ideal for ageing up to 248 bottles of wine protected from all external sources of damage (light, odours, temperature fluctuations, etc.). This stylish, eco-friendly cellar is rated energy class A. Supplied with 6 shelves. Large MZ3V180 conditioning and ageing wine cellar. Elegant with its glass door and its white interior LEDs, it can be integrated into a column or be installed in free standing. 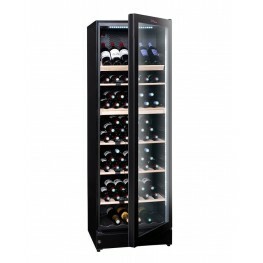 Storage up to 166 bottles in the triple compartment. Delivered with 8 sliding shelves in beech and stainless steel pediment and 1 active charcoal filter. Plumbing passage planned. 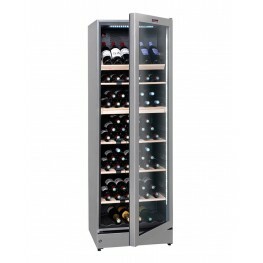 The VIP180 multi-temperature wine cellar is an ageing and conditioning cellar (La Sommelière PRESTIGE range). 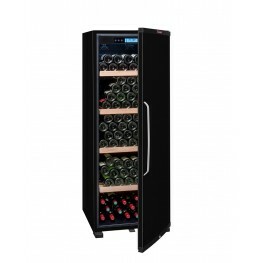 Manufactured in Europe, the VIP180 lets you, depending on your settings, to benefit from 6 temperature zones inside the cellar. 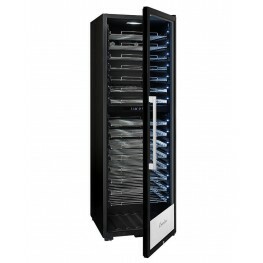 It is designed for free standing installation and accommodates up to 195 bottles. Supplied with 6 solid oak shelves. 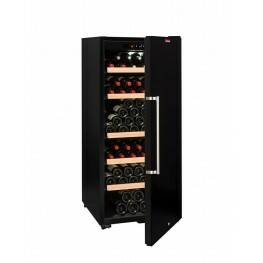 MZ2V165 conditioning wine cellar with storage capacity of up to 165 bottles. 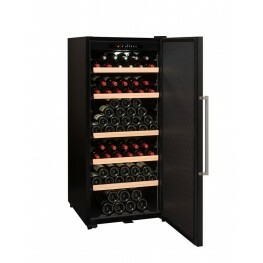 Wine cellar with multiple independently adjustable zones. 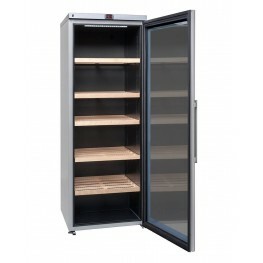 Supplied with 7 wooden sliding shelves and 1 fixed wooden half-shelf. 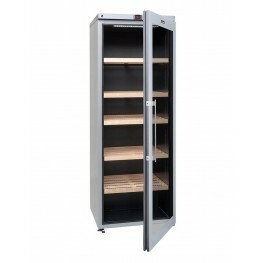 The VIP265V wine cellar is a multi-temperature ageing and conditioning cellar. Manufactured in Europe, the VIP265V is rated energy class A. 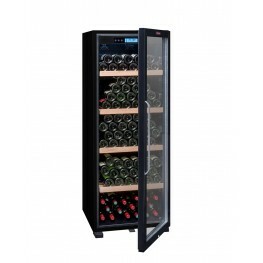 It is designed for free standing installation in your home and accommodates up to 265 bottles for storage in optimal conditions over 3 temperature zones. 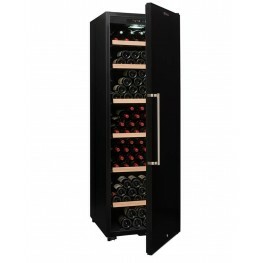 The VIP315P wine cellar is an ageing cellar from La Sommelière's PRESTIGE range. Manufactured in Europe, the VIP315P is eco-friendly and is low energy consuming, falling in the A+ energy class. It is designed for free standing installation and accommodates up to 325 bottles* for storage in optimal conditions. Supplied with 5 beech shelves. 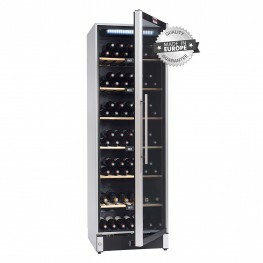 MZ2V135 wine conditioning and ageing cellar with storage capacity of up to 135 bottles. 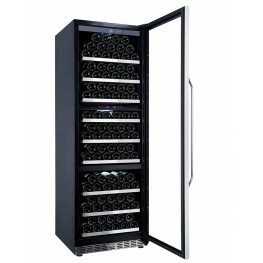 Wine cellar with multiple zones that can be set independently of one another: ideal for storing fine wine in the top section and another type in the bottom section. 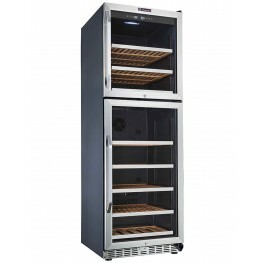 The La Sommelière cheese cellar delivers outstanding technical performance to preserve your cheeses. 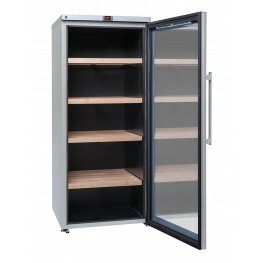 Its key features include constant temperature and regulated humidity. 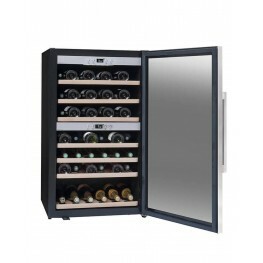 This double-zone cellar means you can set both compartments independently of one another. A cellar fit for a fine cheese maker. VIP265P ageing cellar for laying down up to 265 bottles in total darkness. Supplied with 4 wooden multi-format shelves to provide stability for all bottle formats. High-efficiency A+ energy class. 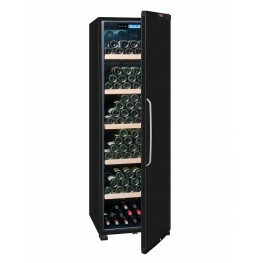 New for 2019, the PF160DZ commercial wine cellar has been designed with professionals in mind. 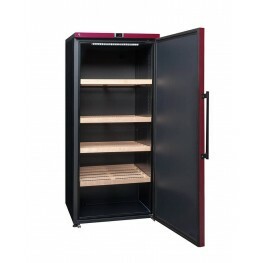 Two independently adjustable zones: ideal for storing red wine in the top compartment and chilling white wine in the bottom compartment. 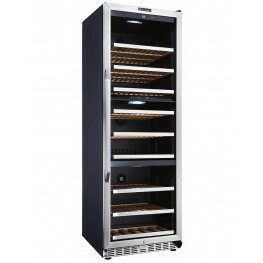 A sturdy, heavy-duty cellar for intensive use in a commercial setting, the PF160DZ is also highly stylish with its white LEDs on both sides of the shelves. 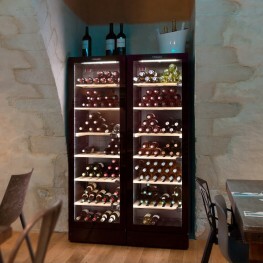 A fantastic showcase for your wine collection. 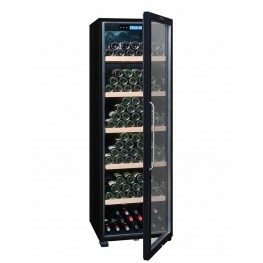 The VIP150 multi-temperature wine cellar is an ageing or conditioning cellar (La Sommelière PRESTIGE range). 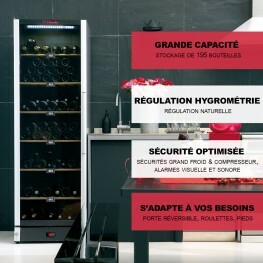 Manufactured in Europe, the VIP150 lets you, depending on your settings, create up to 5 temperature zones inside the cellar. It is designed for free standing installation and accommodates up to 160 bottles. Supplied with 4 solid oak shelves. 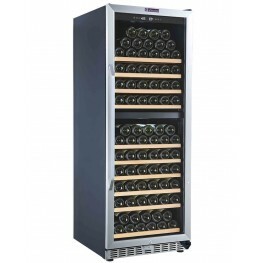 The CTVNE230A wine cellar has capacity for ageing 236 bottles of wine. 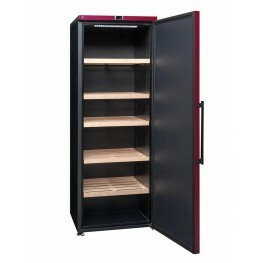 This all-in-black cellar is highly stylish with its large anti-UV glass door. Rated energy class A, the cellar consumes little electricity. 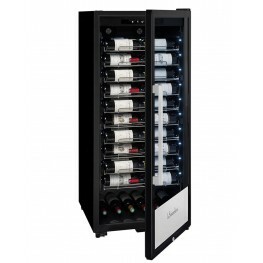 With its refined design, the CTPNE230A+ ageing wine cellar will keep up to 236 of your finest wines in total darkness. Rated energy class A+, it consumes little electricity. 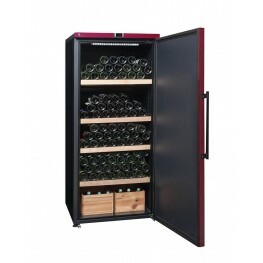 An attractive black ageing cellar with a solid door, ideal for ageing up to 165 bottles of wine protected from all external sources of damage (light, odours, temperature fluctuations, etc.). This stylish, eco-friendly cellar is rated energy class A. Supplied with 5 shelves. CTVNE186A ageing wine cellar for laying down 194 bottles of wine. 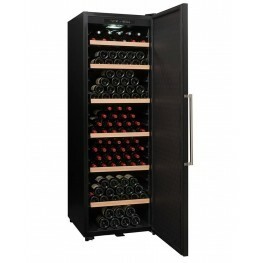 This all-in-black cellar is stylish with its large anti-UV glass door. Rated energy class A, the cellar consumes little electricity. 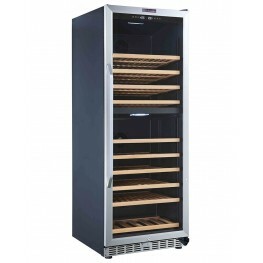 New for 2019, the PF110 commercial wine cellar has been specially designed with professionals in mind. This sturdy, heavy-duty cellar is the stylish as well as practical service solution for up to 107 bottles: all arranged horizontally, the labels are placed facing you so you can identify the vintages stored quickly and easily. 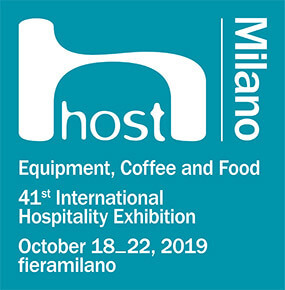 Essential for prompt and proficient service to your customers. 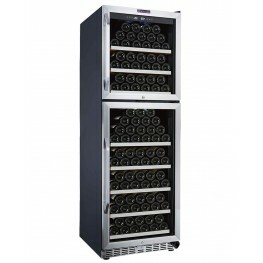 ECS70.2Z Double-zone service wine cellar for conditioning 66 bottles. Each compartment is set independently of the other. Rated energy class A, the cellar consumes little electricity. 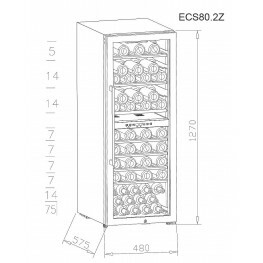 ECS80.2Z Double-zone service wine cellar for conditioning 75 bottles. 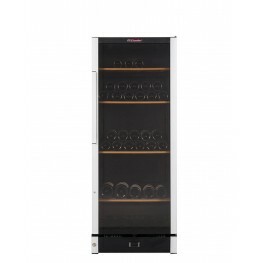 Each compartment is set independently of the other: perfect to store white wine and red wine at different temperatures ... in the same cellar!